The movie studio calendar year of 2004 officially kicks off this weekend as the first two official wide releases of the year find their way into theaters. Along with those two films, Tim Burton's Big Fish will hope to expand on the financial success of its limited release as it adds an extra 2,400 venues to its theater count. Headlining the weekend is the Mandy Moore rom-com Chasing Liberty, a modern-day homage to the 1953 Audrey Hepburn classic Roman Holiday. In the film, Moore portrays a fictional daughter of the President of the United States. Wanting more than anything to experience life as a normal 18-year-old, she runs away from her entourage of Secret Service Agents while traveling in Europe, and finds herself falling in love with a mysterious and handsome British stranger. This character is portrayed by the much ballyhooed Matthew Goode, who apparently is the second coming of Brad Pitt in Thelma and Louise if the television ads are to be believed (and is a Shakespearian theater actor in his native England). Moore's brief movie career has been up and down, with her breakthrough supporting role in The Princess Diaries providing her an excellent jump start. From there, she went on to star in the wholesome teen flick A Walk to Remember, which bagged a respectable $41 million at the box office after a surprise budget-beating debut of $12.2 million. Her follow-up, the disastrous and muddled How to Deal, was a flop, earning only $14.1 million total domestic box office by the time it was all said and done. Chasing Liberty looks to be more of a return to the type of formula that has found success for Moore and other teen stars such as Amanda Bynes and Hilary Duff. In fact, the storyline so closely mirrors the plots of What a Girl Wants and The Lizzie McGuire Movie that it might give one pause, but teenage girls do eat this stuff up. Look for the film to start with $12 million for the weekend before suffering quick drop-offs as its fickle audience will be on to other things within a week. If anyone was ever looking for a Three Men and a Baby for a new generation, My Baby's Daddy will try to fill that void (though of course it's actually about three men and three babies). Co-written by the hilarious Eddie Griffin, it has the potential to be a bit of a surprise breakout, though it really seems to be a bit of a retread of the jokes covered in Daddy Day Care last year. In addition to his writing credit, Undercover Brother Griffin stars, along with Anthony "Please Forgive Me For Kangaroo Jack and See Spot Run" Anderson and the Sopranos' Michael Imperioli. Give it about $8 million for the weekend and probably better-than-usual staying power for the genre since it's targeted a bit more young (it just squeaks by with a PG-13 rating). 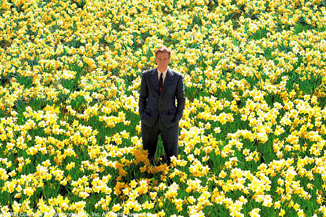 Tim Burton's awards contender Big Fish expands to wide release this weekend after an very admirable performance on its 125 screens. Last weekend, the Ewan McGregor/Billy Crudup/Albert Finney starrer finished at number 12 on the charts with $2.5 million and a $20,355 per venue average. Clearly, it won't be able to maintain that kind of momentum on a broader number of screens, but it does have both good word-of-mouth and strong critical acclaim to recommend it to a wide-ranging audience. Look for a noteworthy weekend total of around $18 million and a first place finish, as The Lord of the Rings: Return of the King will finally start to settle down a bit despite having crossed the $300 million mark before the weekend starts.